Almost 80% of our atmosphere is made up of the element nitrogen bonded together as N2. This represents most of the nitrogen available on Earth. Nitrogen is an important element used by all living things to make proteins, amino acids and the nucleic acids of DNA. Yet its gaseous form (N2) found in the atmosphere is usable. It must be “fixed” into nitrates (NO3–), ammonium (NH4+) or urea (NH2)2CO to be taken up by plants. Animals can get their nitrogen by eating those plants and so it moves through the food webs. When nitrogen is fixed, it is absorbed by plants and then eaten by animals, who then expel it in their waste and eventually die and decompose (releasing more). 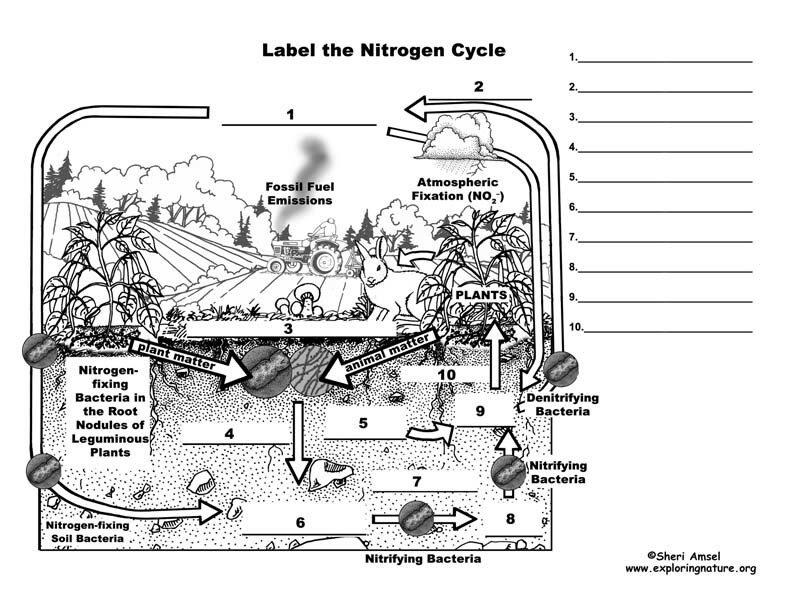 The nitrogen is then released into the soil and then back into atmosphere – this is the Nitrogen Cycle. 1. Nitrogen Fixing is when gaseous nitrogen is “fixed” by either lightning (only up to about 8%), bacteria in the soil, or nitrogen-fixing bacteria in the root nodules of leguminous plants (like soy beans). 2. Decay - The nitrogen in plants is eaten by animals and broken down and expelled in the animals’ waste. Microorganisms further break it down into ammonia. 3. 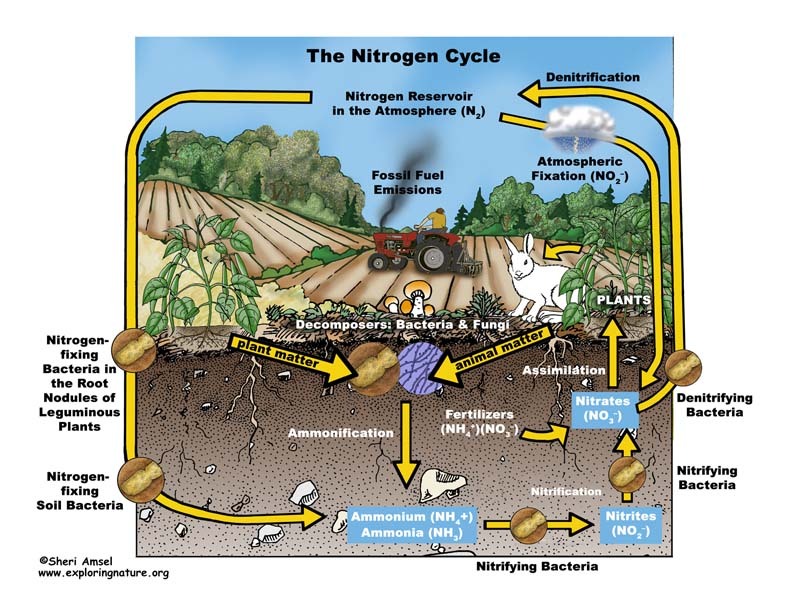 Nitrification - Some ammonia is absorbed by plants through their roots, but most is converted by nitrifying bacteria into nitrites and then nitrates. 4. Dentrification moves the nitrogen in the other direction back into the atmosphere. Dentrifying bacteria reduce nitrites and nitrates into nitrogen gas, releasing it back to the atmosphere to complete the cycle. 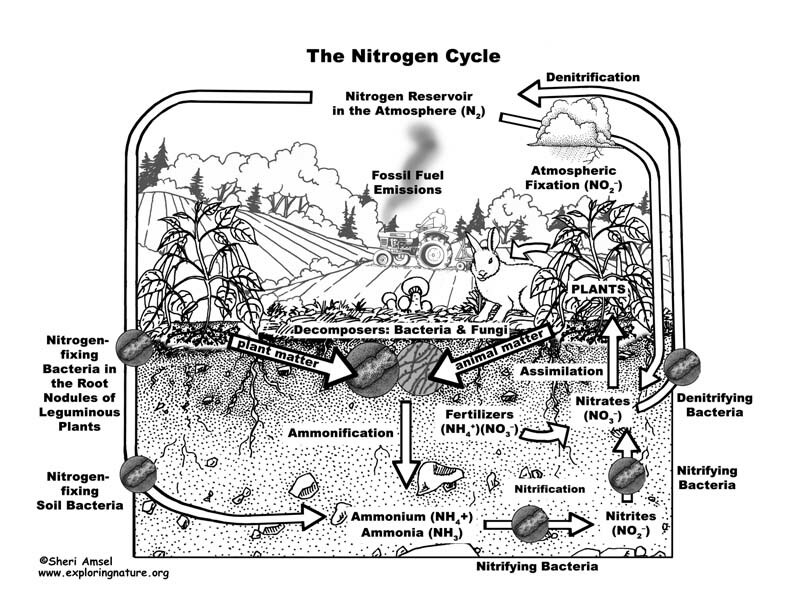 Human actions affect the nitrogen cycle. The amount of nitrogen on Earth doesn’t change, but the way it cycles around the planet does. Agricultural fertilizers and the waste of livestock and suburban lawns release too much nitrogen into waterways (lakes, rivers, groundwater, estuaries and then the ocean) causing algal blooms that can create dead zones in lakes (eutrophication) and even in the ocean. Too much nitrogen is released into the air in concentrated areas by the burning of fossil rules and industrial smokestacks can cause acid rain and increase greenhouse gases.